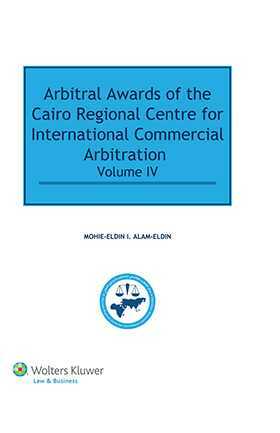 This new volume of cases brought before the Cairo Regional Centre for International Commercial Arbitration is the fourth in a popular series. It includes some of the most important arbitration cases in Africa and Asia involving major construction companies from Europe and the United States during the past decade. You’ll find full details of seven cases, dealing with disputes pursuant to major construction contracts (an airport, a Red Sea port, a Mediterranean tourist resort, and a power plant), and disputes over the validity of the arbitration clause and the dispute resolution procedure itself. This practical title explains the motivations behind arbitral decisions. It clarifies the compatibility of arbitral principles with international legal trends, and will help your understanding of dispute settlement systems worldwide. relief during pre- and post-termination periods. The work is edited and commented by the prominent legal scholar, arbitrator, and lawyer Dr. Mohie Eldin I. Alam-Eldin. His in-depth commentary on the cases discusses the emerging new arbitral trends and principles, along with the new approaches to arbitration brought about by the changing patterns of international trade. This book validates and reinforces the pivotal role played by the Cairo Regional Centre for International Commercial Arbitration. Academics, jurists, arbitrators and corporate counsel, legal practitioners, scholars, and others dealing with commercial arbitration, not only in the region but worldwide, willfind the insights in this book extremely valuable to their work and study.